Hundreds of family, friends, and colleagues gathered to celebrate the life of Dr. Donald Liu at a memorial service in Rockefeller Chapel yesterday. Liu passed away at the age of 50 on August 5 while vacationing with his family near Lakeside, Michigan. He drowned after rescuing two children who were caught in a rip current in Lake Michigan. Liu, M.D., Ph.D., was the Surgeon-in-Chief at the University of Chicago Medicine’s Comer Children’s Hospital. Immediately following his death, Liu was described by numerous sources as heroic and praised for his zest both inside and outside of the operating room. “He was all about the children, and his enthusiasm inspired colleagues and the whole staff at Comer Children’s Hospital. That he died the way he lived, while saving children, is somehow consistent and heart-wrenching at the same time,” University of Chicago Medical Center (UCMC) Surgeon-in-Chief and former colleague Jeffrey Matthews said in an August press release. 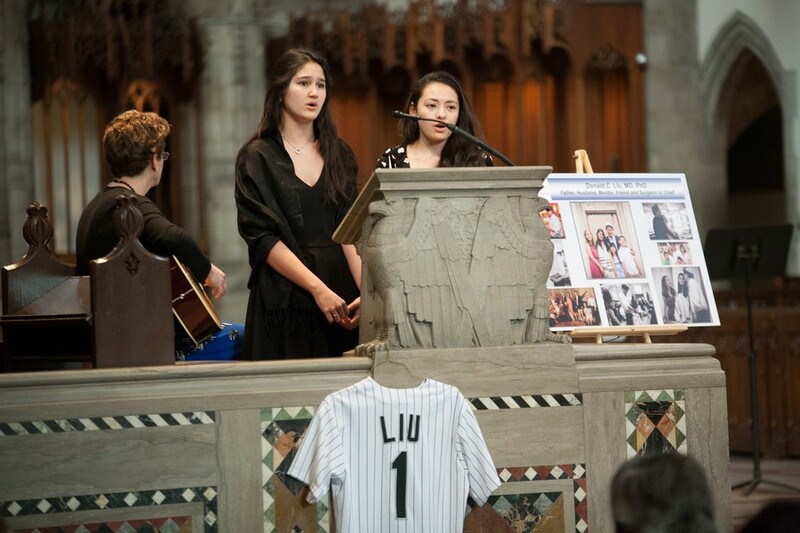 During the service, a diverse assortment of speakers shared stories about Liu at various points in his life—from the time he was accidentally electrically zapped during a cardiac resuscitation and simply apologized for being in the way rather than getting angry, to the hours he spent coaching baseball for local children in Washington Park, or the time he accidentally stole a stranger’s car in his rush to drive home to make his daily 5:30 p.m. dinner with his children. Gail Rodman, the mother of one of Liu’s former patients, recounted the level of dedication and kindness Liu exhibited in his job. “He made it feel like [my son] was his only patient,” she said. Liu’s wife Dana Suskind, a professor of otolaryngology at UCMC, closed the service, speaking of Liu’s “superhuman,” yet humble personality. According to Suskind, the hundreds of letters she received about her husband after his death revealed countless accomplishments Liu had never told her about. “I think what was most shocking was that my man was not, in fact, well-dressed,” Suskind joked, referring to Liu’s trademark habit of wearing scrubs everywhere. Suskind proceeded to read excerpts from several letters she received expressing gratitude towards Liu’s humanity. In one, the family of a former patient who died in the ICU recounted how Liu’s presence and personality brought them peace during a sad situation. At one point, Liu’s oldest daughter Genevieve, 13, performed John Denver’s “Leaving on a Jet Plane” with a friend. According to Genevieve, her father loved the song and sang it to her every time he had to leave for his evening hospital shifts. Liu’s youngest daughter Amelie, 6, said that she still imagines her dad is working long hours in the hospital. Despite the eclectic nature of the memories of Liu shared during the service, Liu was consistently characterized as infectiously happy, a masterful surgeon, a great friend, and a loving father. “It will be his humanity that will be the most important and lasting part of his life,” Suskind said.